A beautiful church usually occupies the centre of every Maltese town and village. 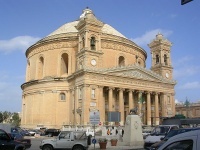 One of the most impressive of these is St Mary's in the central Maltese town of Mosta, also known as the Rotunda of Mosta or the Church of the Assumption of Our Lady, which has a glorious blue, gold and white dome. The unsupported dome is one of the largest found anywhere in the world, with a design visibly inspired by the Pantheon in Rome. Construction on the church began in May 1833 and ultimately ended in the 1860s. Many say that St Mary's Church was the site of a World War II miracle: in 1942, while 300 people were praying in the church, a bomb crashed through the dome and landed on the mosaic floor, but did not explode. A replica of the bomb is today displayed in the church sacristy. This famous miracle draws many pilgrims and curious tourists to the church, but the ornate interior is reason enough for a visit. The church has a fine collection of religious art, including one of the largest collections of paintings by the famous Maltese artist Guzeppi Cali. The church is still an active place of worship and visitors are welcome to attend services. Entry to the church is free but donations are welcome. The church is usually closed between 12pm and 3pm.